Turkish President Recep Tayyip Erdogan has turned on Ankara’s allies, insinuating that the US in particular has been providing massive military support to Kurdish YPG in Syria. In a speech to his ruling AK Party, RT reports that Erdogan said that ‘some allies’ of Turkey had provided the YPG Syrian Kurdish militia with 2,000 planeloads and 5,000 truckloads of weapons. “Now, apart from 5,000 trucks, there are weapons and ammunition from around 2,000 planes.” the Turkish leader said. He also accused Ankara’s allies of dishonesty when they say that they do not provide weapons for “terrorists,” referring to Kurdish-linked YPG forces. "Anyone who opposes Turkey’s operation in northern Syria’s Afrin region is siding with terrorists and will be treated accordingly," Turkish Foreign Minister Mevlut Cavusoglu said on Sunday. "We hope France will support Turkey's operation against terrorists in Syria," the minister added in reference to what Turkey has dubbed 'Operation Olive Branch'. 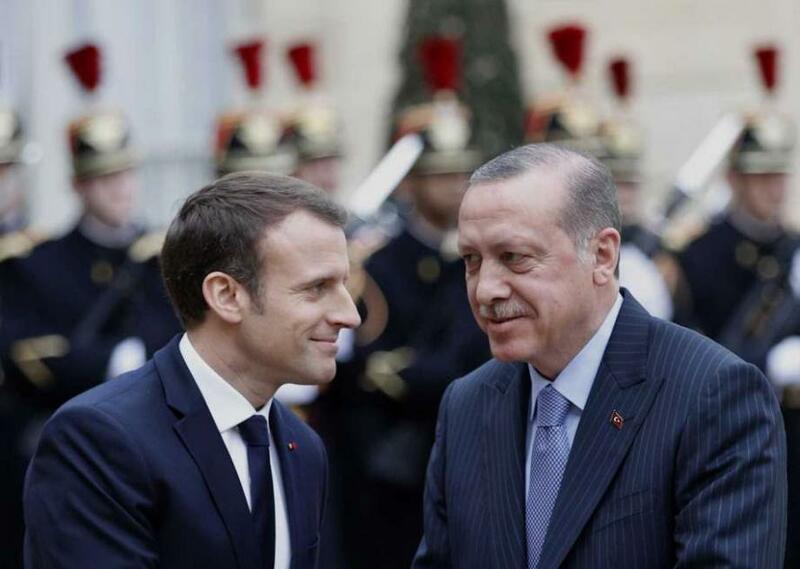 After the Turkish military invaded northwest Syria over the weekend in an operation that President Recep Tayyip Erdoğan described as cleaning out Kurdish "terror nests", France called for an emergency meeting of the United Nations Security Council. FM Çavuşoğlu's words were given in warning to French politicians who say they will take up the issue of Turkish aggression at the UN. France has urged Turkey to exercise restraint in its air and land assault targeting US-backed Kurdish forces in Afrin, near Turkey's border. "France calls on Turkish authorities to act with restraint in a difficult context, with the humanitarian situation deteriorating in several regions of Syria as a consequence of the military actions of the Damascus regime and its allies." The French FM also took to twitter to announce that an emergency UN Security Council session is set to meet Monday - though strangely (though not unexpectedly) his harshest condemnation was still reserved for the "Damascus regime and its allies" even as Turkey is now bombing civilian urban areas from the air. Ambassador Le Drian further issued a direct message by phone to his Turkish counterpart Mevlut Cavusoglu on Sunday. Syrian Kurdish media has accused Turkey of launching the campaign out of a desire to ethnically cleanse the Turkish border region of its historically Kurdish identity. Indeed Erdoğan has vowed "to give Afrin back to its real owners" while claiming that "55% of Afrin is composed of Arabs with 35% of Kurds coming there later on". This as invading Turkish-backed militias (FSA) have been filmed shouting chants related to the ethnic cleansing of Kurds, according to Middle East analyst Hassan Hassan. Thus Turkey's president is openly voicing a goal of radical demographic shift in northwest Syria based on claimed ethnic statistics as his army invades foreign soil. Though accurate numbers are difficult to come by, Kurdish media reports dozens of dead and wounded civilians - including children - from the over 100 airstrikes that pounded Afrin Canton over the weekend. Various international reports have cited numbers of civilians killed ranging from 7 to over 20, with many more wounded victims flooding hospitals in Afrin. This weekend, Turkey began operation ‘Olive Branch’ against Kurdish forces in Afrin, deploying jets and land forces. On Sunday Turkish Prime Minister Binali Yildirim confirmed that tanks and military vehicles had begun to cross the Syrian border, according to Haberturk. They were said to advance roughly five kilometers into the Afrin region. Yildirim also said the Turkish military, NATO’s second-largest, would create a 30-km (19-mile) “safe zone” in the region. All of this was precipitated by multiple warnings issued by top Turkish officials claiming that the US was complicit in creating a "terror safe haven" along Turkey's border as the Pentagon recently announced it would be creating a 30,000 strong predominantly SDF "border force" ostensibly to protect US friendly zones from terror attacks. As a reminder, Turkey sees the YPG as being closely linked to the Kurdistan Workers Party (PKK) – whom the government considers terrorists. However, the US stressed on Saturday that they are not supporting the PKK. “We recognize Turkey’s security concerns about the PKK, a US-designated foreign terrorist organization,” Adrian Rankine-Galloway, the Pentagon’s spokesman said in a statement sent to the Anadolu Agency. "The brutal Turkish aggression on the Syrian town of Afrin cannot be separated from the Turkish regime’s policy from the first day of Syria’s crisis, which was essentially built on supporting terrorism and terrorist organizations, whatever their names." Assad referenced the widely reported fact that NATO member Turkey has allowed jihadists - most of them linked to ISIS and al-Qaeda - to flow freely across its border with Syria for years in pursuance of regime change in Damascus. It will be interesting to see the US articulate its position over the crisis during Monday's UN emergency session, especially as US ally and NATO member Turkey is attacking what is essentially a US partner force on the ground in northern Syria. But it appears that so far the US is willing to throw its Kurdish allies under the bus - at least as far as YPG in Afrin is concerned.